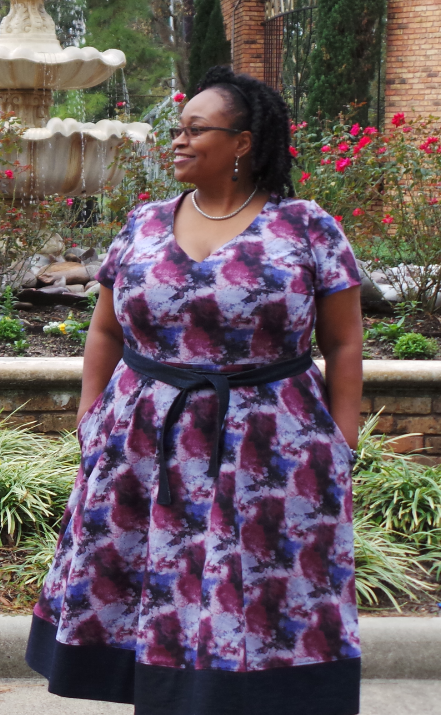 The Kimberly dress is a gorgeous dress intended for woven, non-stretch fabrics. 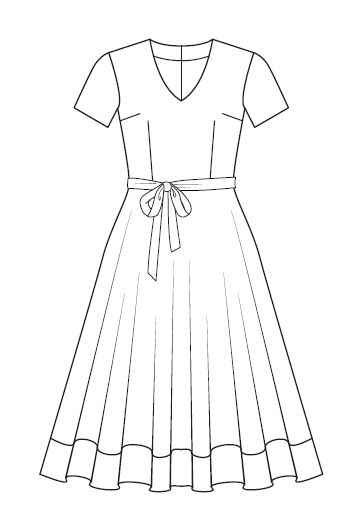 It has a soft V-neckline and a half circle skirt with a panel at the bottom. The design includes optional pockets and an optional tie belt. Version 1 is a long-sleeved dress, while Version 2 a short-sleeved dress, making it the perfect garment to wear all year round. 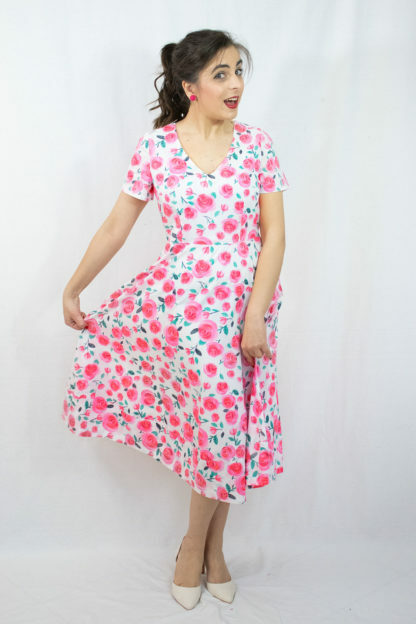 Designed with adventurous beginners in mind, this dress will teach you some of the basic dressmaking techniques, like stitching darts, sewing an invisible zip, inserting sleeves, attaching a facing and more. If you need any help, you can check out our video sewalong, that guides you step by step through the sewing process. In addition, this dress could also be made out of knit (jersey) fabrics after making some modifications. You can read all about that in this tutorial. 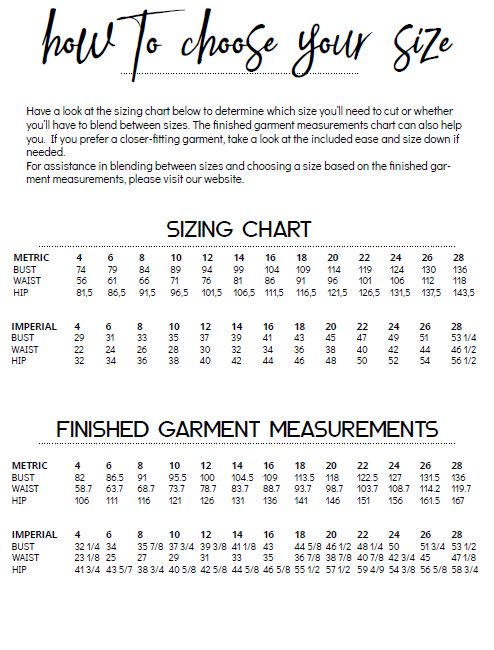 As for the size range, all our patterns come in sizes 4-28. Find out more about this sewing pattern from Athina Kakou Sewing Patterns here. 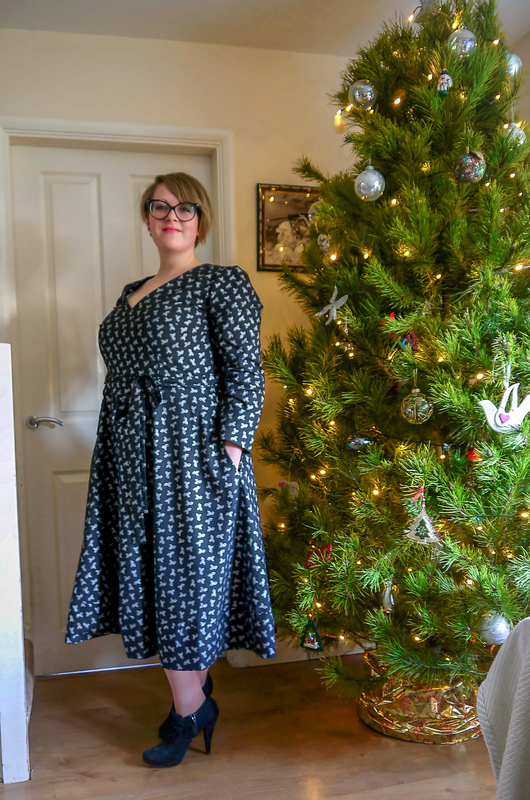 I couldn’t help myself when Athina Kakou put out another pattern review request, this time for her very beautiful Kimberly Dress. From her sneak peak drawing of it a good few weeks ago, I thought it was a really beautiful dress and that if the chance came along, I would love to try it. However, I am not a wearer of dresses. I haven’t worn one since I got married, and I’ve only worn a dress on rare occasions before that. But I really wanted to make the Kimberly dress for me and with it being a December make, it had to be for Christmas. 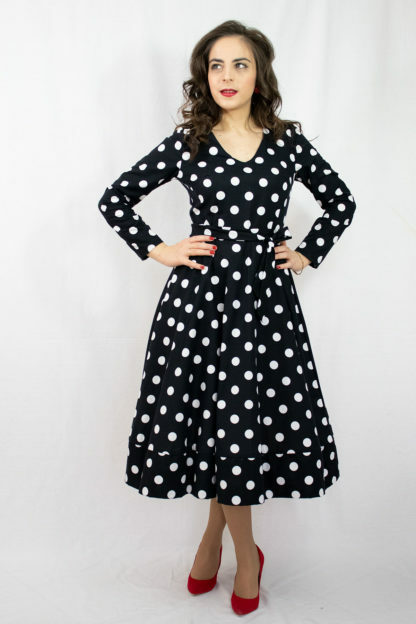 The dress is designed for woven fabrics without stretch; has a soft V-Neck and gorgeous half-circle skirt with a bottom panel to save us from hemming! There is the option for seam pockets and a tie belt too. Two versions are available as long and short sleeved options making this an all year round make. Athina has been ever thoughtful in her design for making the dress extremely accessible for the upper range of sizes. This dress is available to make in sizes 4 all the way through to 28. I am of the opinion that all designers should be doing this and for me, Athina is certainly out in front for beautiful, inclusive designs. She has been so careful to make sure that the design elements of the panel and the half circle skirt work for all fabric choices and I applaud her. I myself have made the size 20. 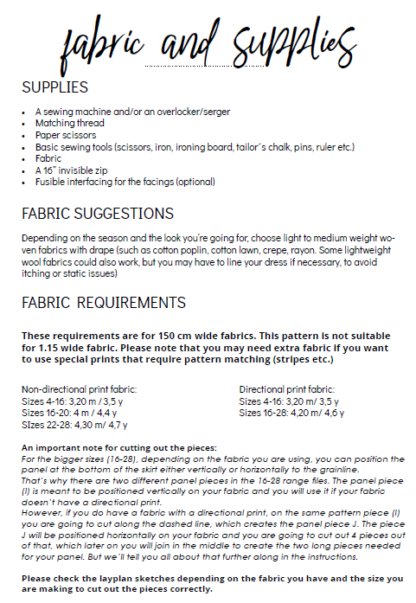 The pattern calls for 150cm/59in wide fabric of light to medium weight. My initial idea for this dress was a Christmas dress in red with a non-directional print that would be flattering. I wanted to make the dress quickly and not worry about the directional print, but I had a hard time finding exactly what I was after in the required weight and width. After a lot of searching and narrowing down, I cam across the Christmas Holly Leaf Cotton Poplin from Minerva Fabrics in black and silver. It was 56in width but I decided to wing it and hope for the best as I wasn’t making the largest size and hoped I’d have a little room to play with. I was lucky this time and the fabric is really lovely. It has a great feel to it and sews beautifully. Whilst the pattern will come with a dedicated sewalong, there wasn’t one at the time I made the dress. Athina does recommend that following the Lisa Dress sewalong will be a good help, as it is fairly similar. I decided I would just go with the pattern instructions as they are so well written and the pictures very good at showing you what goes where. I also feel the confidence in my sewing has grown when it comes to knowing what I’m supposed to do now. I decided to make a toile for the bodice as I haven’t made anything for myself that is this fitted before and I didn’t want to get the size wrong. The toile fitted quite well, even over my full bust-I didn’t have to do a full bust adjustment. I did make a conscious decision to take the seam allowance out just a touch though for a little Christmas dinner wiggle room. There are 6 darts to put in to start with and Athina shares a great little tip to get them as accurate as can be; mark a dividing line through the centre of the dart so you can fold accurately. Genius! There is a neck facing to add which I did use interfacing for. I’ve only done one neck facing before but the instructions Athina gives brought everything back and it was straightforward to add on. This dress calls for gathered sleeves: I haven’t done any gathering before, let alone a gathered sleeve. I had to do a little googling and youtubing for this one, but ultimately I’m happy with the result. 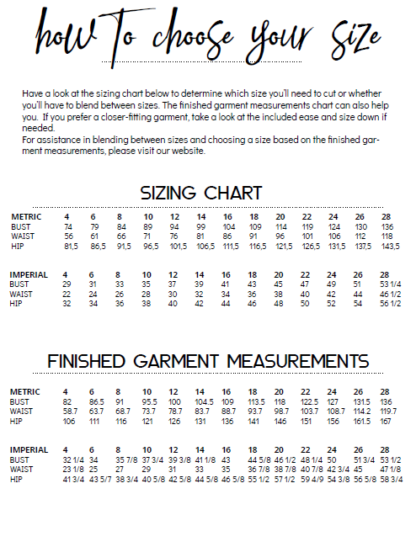 The pattern also gives lots of notches to really help guide you through inserting the sleeve, so that takes away some of the worry of getting it right. I love that this dress has pockets and there was no way I was leaving them out. They’re very simply added to the side seams of the skirt and take no time at all to add. With the skirt being quite full too, you don’t see any bulk from the pockets either. Inserting the invisible zip is pretty straight forward, I’ve only done one before, but it wasn’t this long. I got on YouTube for a refresher and it came together nicely. I definitely recommend using an invisible zipper foot, and basting the zipper in place. The panel is really straight forward to put on and I most definitely prefer it than hemming. Athina provides lots of notches which makes the rather long job of attaching it, much much easier. I decided to make the belt too, which doesn’t take long at all and is a really lovely addition at the waist. When I tried the dress on and zipped it up for the first time I felt awesome. I had made a dress that not only fitted, but felt comfortable. For the first time ever I was comfortable in a dress. Thank you Athina! I think I may even be a bit of a dress convert and if I have an event next year that requires something nice to wear, I will definitely make another Kimberly dress. On Christmas day I wore the dress and felt so comfortable. All my family said how beautiful the dress was and that I looked lovely in it. I felt that in hindsight, I didn’t need to change the seam allowance at all as I had more than enough wiggle room at the waist and it was a little too big at the neck, but that was only noticeable when I sat down, and probably only to me because I was aware of it. I also think that next time, I would shorten the skirt just a touch. I liked the length on me, before I added the panel. Now it may have been because the skirt had no time to hang and dropped with the panel on; whereas, if I had the time to wait, I would’ve been able to check the length after leaving it to hang and then adjust from there. Other than that, I am absolutely delighted with how the dress turned out. I think that Athina has turned me to dresses with The Kimberly Dress and I will certainly be open to making and wearing myself more in future. The dress is definitely for the adventurous beginner the gathering and invisble zipper, as well as lots of attaching here and there can be quite challenging, but well worth the end result. All in all, I think the dress took me around 12 hours to make from start to finish, I took my time on the trickier and new techniques, but I still think that’s a fair time. In terms of the fit; the bodice is fitted and gives a lovely shape. The sleeves aren’t tight at all and the skirt has a lovely swish. I didn’t really make any alterations, just a little to the seam allowance for extra wiggle room, but in the end, I don’t think I needed to do that. I should’ve trusted the process and Athina’s fitting chart, because it was pretty darn accurate. A great and very helpful review, thanks. 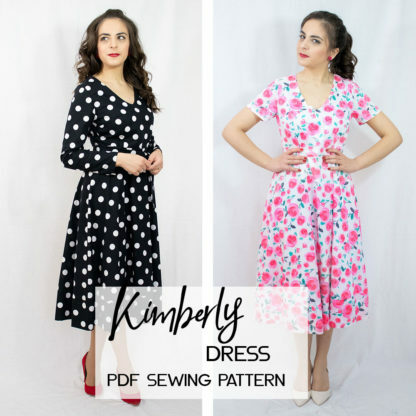 I was chuffed to bits to be a reviewer for Athina Kakou’s Kimberly Dress Pattern for the month of December as I had seen the pattern when it was released and knew it was a style I liked with a fitted bodice and fuller skirt. Being a December review it seemed obvious to make this as my Christmas Day dress and I had an idea of what I wanted so the plan was hatched. I had the idea that this style could be reminiscent of those gorgeous 50’s movies – think Grace Kelly in Rear Window but I really fancied making it in jersey, after all I planned to wear this on Christmas Day to enjoy all the fabulous food and also surprisingly enough I am not Grace Kelly so comfort was the way to go. Athina is really good at detailing options with her patterns and invariably details many hacks and sewalongs to keep each pattern interesting. So, although this is primarily a pattern for a woven fabric she has indeed the option to make it in jersey. I picked up a very simple grey ponte in my local fabric shop as well as a black stretch velvet and set to work. The pattern instructions are clear and concise and great for beginners but as I was going off piste with this I relied on her website where she details the changes needed to make the dress in jersey. Firstly, size down, then front and back bodice pieces need to be tweaked to take out the seam allowance to then be cut on the fold. Essentially that was as complicated as it got. 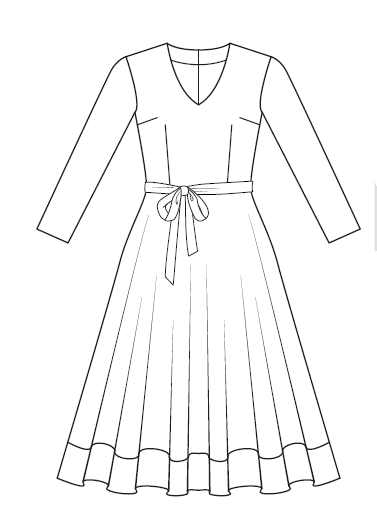 I did then need to draft a neckband and used the instructions on Athina’s Sheona dress to do it. Full disclosure, this was my first V neckband and I am pretty proud of it. The dress came together quickly as I was able to construct most of it on the overlocker. I will admit the stretch velvet was a bit of a struggle but lots of pins, slow and steady sewing seemed to do the trick. 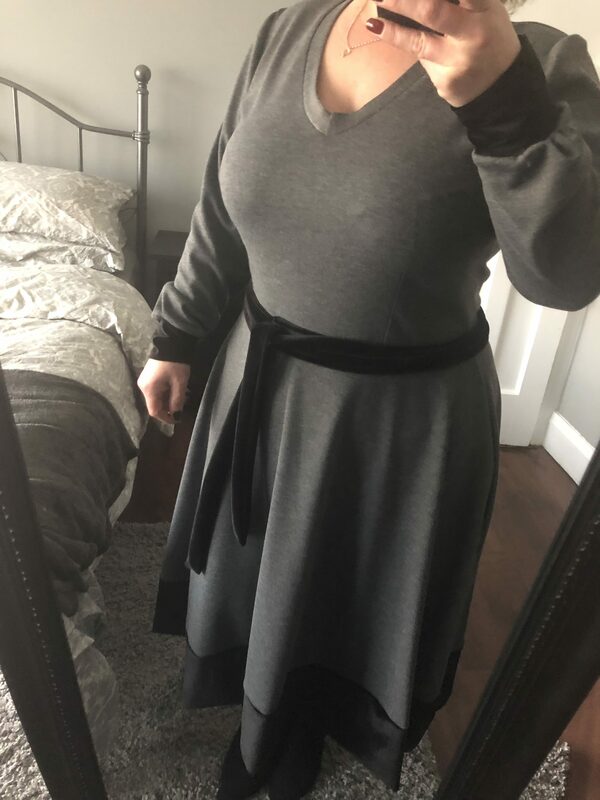 I used the velvet for the bottom band of the dress, the cuffs (these aren’t part of the pattern, I just added them for the look I was going for) and the waist tie belt. I was looking for a simple but classically elegant dress that was comfortable and I really think this hit the mark. I wasn’t sure initially with the tie belt because I am quite short and think sometimes belts can exaggerate that but because it’s quite a thin belt it actually works and really completes the old movie look I was going for but also works just as well without it. I did end up wearing it without the belt on Christmas Day and got a lot of lovely comments on the dress. So, that’s a success in my book. I will definitely try the pattern again, probably in a woven for the spring / summer.